According to the National Highway Traffic Safety Administration, 18 percent of traffic fatalities are motorcycle accident-related. Of the nearly 5,000 motorcycle fatalities that occur each year, the motorcycle driver is the one who is killed in 94 percent of them. So, what do these numbers mean for you? They help illustrate the magnitude of risk that you take every time you rev up your motorcycle’s engine for a brisk ride through the city streets. Although the dangers of suffering catastrophic collision injuries are greatly amplified when riding a motorcycle, this doesn’t necessarily mean that motorcycles should be banned from roads or used as non-functioning trophy pieces. In fact, these statistics should help you understand the importance of safety and the need to perfect your bike maneuvering skills to increase your ability to protect yourself and passengers from disaster. Obstacle swerves. 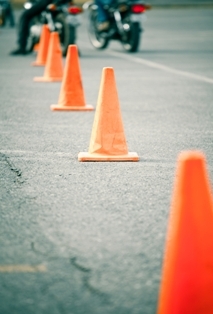 Create an obstacle course of traffic cones, sticks, and other debris. At first, slowly snake your way through the course, being careful not to run over any objects. As you get used to swerving, challenge yourself by placing obstacles closer together or by having a friend roll or throw obstacles in your path. As you improve, you can increase your speed—just remember to take it slowly and stay safe. This training will prepare you for real-world scenarios like animals running in your path, potholes, and other roadway obstacles. Stop turns. Although motorcycles have more flexibility than four-wheeled vehicles, even on two wheels, turning from a dead stop can be difficult. However, this skill is important for avoiding head-on and T-bone collisions when oncoming traffic fails to see you at an intersection. Keep your bike stationary and have a friend randomly give you a signal to turn. Once you’ve mastered the turn, practice turning and accelerating from a stopped position to help master increasing your safety distance from an offending vehicle. Sharp turns. Once you’ve mastered stop turns, you can practice sharp turns. This tactic is useful for avoiding collisions that have already occurred (instead of slamming into the back of a vehicle) as well as avoiding potential dangers. From a steady speed, start making 45 degree angled turns. Once you feel comfortable with this angle, slowly build up to 90-degree turns at a steady speed. Hard braking. During any of the above drills, when you must come to a stop try stopping abruptly without a braking distance of more than a few feet. Hard braking (or braking with all your force) can help you avoid rear-end collisions as well as surprise obstacles. Be sure to control your balance and avoid any sliding or tipping. Kick-free falls. In some accident scenarios, you may lose your balance or control of your bike. When this occurs, you have three options: get pinned underneath the machine, get dragged by the machine, or free yourself from the machine. Obviously, you want to free yourself. This is where the kick-free fall comes into play. From a stationary position, have your friend/friends spot you as you slowly tip your motorcycle toward the ground. As your friends hold the bike, practice kicking or throwing yourself away from the area where the bike will fall. This can be extremely difficult so don’t get frustrated if you can’t do it. During scenarios where the kick-free fall will benefit, you just need to remember to try to free your legs and hips from the bike before it topples onto you. Another tactic is to throw yourself on the ground before the bike and roll to safety. Any one of these maneuvers could wind up saving your life—or at the very least minimize debilitating injuries. Before your next joyride, take the time to practice these skills so when you need them, you’ll be prepared. Post a Comment to "Basic Maneuvers to Keep You Safe This Motorcycle Season"